See also: North Carolina Tax Relief Association; Taxpayers' League. North Carolina first imposed income taxes in 1849, when it levied a 3 percent tax on interest, dividends, profits, wages, and salaries and a fixed fee of $3.00 on citizens with incomes in excess of $500. Aimed at the growing class of merchants and craftsmen viewed by the agricultural society as undertaxed by the existing state tax system (an ad valorem tax on real property and the poll tax), the new assessment was intended to tax those who did not earn their income primarily from land. From its inception the income tax was an important, though variable, part of the state's tax structure. By 1854 it produced 56 percent of total tax revenues, compared to 44 percent from real property and poll taxes. After the Civil War, however, the income tax was not a major revenue source, as it was collected by local officials who had no way of verifying an honest listing of income. The 1868 state constitution authorized the General Assembly to tax "trades, professions, franchises, and incomes" but added the provision that "no income shall be taxed when the property from which the income is derived, is taxed." Widespread complaints persisted that the rate of taxation on nonproperty income was too low compared to the rate on property income. In 1903 the State Tax Commission recommended a remedy to this alleged inequity: the state would relinquish use of the property tax, leaving it solely as a local tax source and thus eliminating the incentive for counties to underassess property. The state would then rely solely on income, license, franchise, and inheritance taxes. The 1913 General Assembly proposed a constitutional amendment to implement the recommendation, which was rejected by voters in 1914. But in 1919 the legislature enacted a proposed constitutional amendment to permit the taxation of all income, including income from property, which passed by a large margin in 1920. The legislature also passed a Revaluation Act, which called for a statewide revaluation of all property under the supervision of the State Tax Commission. In 1921 the General Assembly reformulated the state tax system under the principle that the sources of state and local taxes should be separate. To replace property tax revenues, it enacted a state-administered personal income tax and a corporation income tax, then created the North Carolina Department of Revenue to administer, enforce, and collect the new taxes. The new personal income tax, including exemptions, deductions, and a system of progressive rates, was based on a model developed by the National Tax Association. With the reforms of 1921, North Carolina became one of the first states to relinquish the property tax and to adopt a state-administered income tax. In doing so, the state government lost a source of revenue that had accounted for over 30 percent of its total revenue in 1919. However, the state more than offset the revenue loss by passing a gasoline tax. In the early 1930s the responsibility for financing schools, roads, and prisons was shifted from counties to the state and a retail sales tax of 3 percent was enacted. The system of taxation and government finance that emerged during the 1931-33 period has remained essentially unchanged. North Carolina relies primarily on personal and corporate income and retail sales taxes, which vary widely from month to month, for raising general state revenue. A number of studies and investigations of North Carolina's tax structure have been undertaken through the years, and citizens' groups, such as the North Carolina Tax Relief Association and the Taxpayers' League, have worked for changes in the system. At the governmental level, the Tax Study Commission was the designation for various commissions created or authorized by the General Assembly in 1955, 1957, 1965, 1967, and 1971. The purpose of the commissions was to examine a variety of tax situations and inequities in the state and suggest ways to eliminate them. All of these commissions held public hearings and received assistance from state agencies (such as the Department of Revenue, the Department of Tax Research, the Office of the State Treasurer, and the Institute of Government at the University of North Carolina at Chapel Hill) and from professional and other organizations. Governors Luther H. Hodges and Dan K. Moore-chief executives during the time of the 1955-68 Tax Study Commissions-enthusiastically supported them. Hodges, in a June 1955 address on a statewide radio and television network, said that the creation of that year's commission was one of the most significant measures passed by the legislature. The tax commissions uncovered several serious flaws in the state's tax system. For example, in 1958 the Tax Study Commission reported that ratios of assessed value to actual market value of real estate varied considerably from county to county and within the same county, and that different types of property were often assessed at different percentages of market value in a given county (such as real estate at 40 percent, automobiles at 6 percent, and retail inventories at 50 percent). In 1977 the Revenue Laws Study Committee, previously a subcommittee of the Legislative Research Commission, was established as a permanent legislative commission dedicated to tax issues. The committee effectively replaced the earlier Tax Study Commissions, examining revenue laws and making recommendations to the legislature. Although tax laws often change, by the early 2000s North Carolinians paid income taxes in four different tax brackets with rates ranging from 6 percent to 8.25 percent. The state sales tax was 4.5 percent, but various additional local rates in certain areas lifted the total sales tax to 7 percent or more. Leslie E. Carbert, The Impact of State and Local Taxes in North Carolina and the Southeastern States (1976). Lucille Howard, A Study of North Carolina Taxes and the Impact on Taxpayers (1989). Charles D. Liner, Business Taxation and Economic Development in North Carolina (1983). Liner, "Changes in North Carolina's Tax System: The Last Decade," Popular Government 57 (Summer 1991). North Carolina Department of Revenue "D-400 without TC." 2011. Image from the North Carolina Department of Revenue. http://www.dor.state.nc.us/downloads/D400.pdf (accessed September 19, 2012). 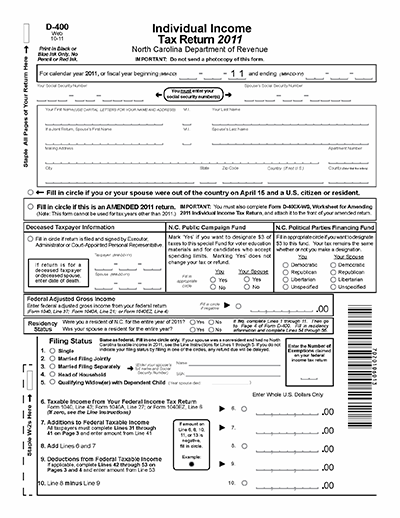 Could you provide me the North Carolina individual income tax rate for 1955? I am referring your question to Reference Services at the NC Government & Heritage Library. A reference librarian will contact you shortly to help with this question.